is an interactive platform for users to express their dissatisfaction with products and services. Customers can publish complaints against institutions both public and private, which other customers can then access on the website. A notification is automatically sent to the company, who is then given the opportunity to respond. The companies are thereby confronted with the complaint and given a chance to resolve it, all before the public eye. can publish their complaints anonymously in a few mouse-clicks without having to create an account, and the service is completely free. The publication of the complaint helps to ensure that the company react quickly and appropriately. can use the complaints in order to recognize and improve problem areas within their products or services. An appropriate reaction to a complaint facilitates a long-lasting healthy customer relationship for existing customers as well as enables the company, with the publication of a solution, to set themselves apart from their competitors in order to gain new customers. 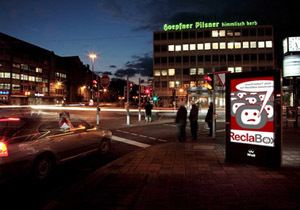 ReclaBox is currently only available in German.